"KHN" redirects here. For the news service, see Kaiser Family Foundation. Nanchang Changbei International Airport (IATA: KHN, ICAO: ZSCN) is an airport serving Nanchang, the capital of Jiangxi province, China. 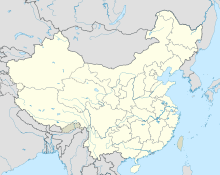 It is located 28 kilometres (17 mi) north of Nanchang. Construction began in October 1996 and the airport went into operation on 10 September 1999, replacing Nanchang Xiangtang Airport. It was upgraded to an international airport and was greatly expanded in 2008–2011. Nanchang Xiangtang Airport, a dual-use civil and military airport, served as Nanchang's main airport from 1957 to 1999. From 102 passengers in 1957, by 1996 Xiangtang served more than 800,000 passengers annually and could no longer accommodate more traffic. In 1996, construction began for Changbei Airport, originally designed to handle 2 million passengers annually. On 10 September 1999, Changbei Airport was opened and all commercial flights were transferred from Xiangtang, which reverted to sole military use. In 2003, Capital Airport Holding took over the operation of Changbei Airport from the Jiangxi Provincial Government. In the same year, it handled more than 1 million annual passengers for the first time. In 2004, Changbei was upgraded to an international airport. Passenger volume grew exponentially in the 2000s, and the airport underwent major expansion in 2008. At its completion in 2011, Changbei Airport became a Class 4E international airport, capable of handling 12 million passengers per year. However, the rapid expansion of China's high-speed railway network diverted much of the airport's passenger volume, and passenger growth at Changbei slowed to 6.3%, 3.4%, and 5% in 2014, 2015, and 2016, respectively. The governments of Nanchang city and Jiangxi province began subsidizing new flights in 2017 and passenger volume grew by 39% in that year and exceeded 10 million for the first time. By 2018, the airport hosts 46 airlines, which operate 127 routes connecting Nanchang with 68 cities. The third phase of expansion, which will connect the airport to Nanchang Metro and the high-speed railway network, is under construction. Part of the airport exterior roof collapsed during strong winds on 4 March 2018. ^ a b c d e f "南昌机场借力大开放 拥抱"航空梦"". CAAC News. 2018-08-15. Retrieved 2018-09-29. ^ "Hong Kong Airlines Adds Nanchang Service from late-April 2015". Airlineroute.net. 26 March 2015. Retrieved 26 March 2015. ^ "'นกแอร์' ใช้ 'สนามบินอู่ตะเภา' เป็นฐานการบินเช่าเหมาลำ (Nok Air will operate 4 direct charter flights a week from UTP to KHN)" (in Thai). Voice TV. 2 October 2017. Retrieved 2 October 2017. ^ Shenzhen Airlines adds Nanchang – Macau service from April 2019 Routesonline. 18 March 2019. ^ "Video: Part of roof collapses at China's Nanchang airport amid strong winds | Hong Kong Free Press HKFP". Hong Kong Free Press HKFP. 2018-03-05. Retrieved 2018-03-09.